Counselor Cynthia Vigil assists, in her busiest months, more than 375 students at Spokane Falls Community College. When Washington state community colleges were faced with budget cuts during the recession, they had a choice: Either keep instructors, or keep advisors. The colleges chose to keep instructors, thinking that would let them offer the same number of courses, which would help students to graduate on time. Those same colleges are now finding that guidance and support is crucial for students who want to further their education after community college, says Laura McDowell, a spokeswoman for the Washington State Board for Community & Technical Colleges. For students who hope to transfer to a four-year college, like Sierra Abele, it can take years to even settle on a plan. Abele, a Spokane Falls Community College student, works three jobs. From the day she graduated from Central Valley High School until now, she's taken one year off, spent about three years in college either at SFCC or Spokane Community College, and spent one year as a dental assistant. Since she's been back at SFCC this time around, the 24-year-old has worked with advisors to put together a course plan so she can earn an associate degree and transfer to Washington State University, where she can study biology and go into veterinary medicine. "I've been doing really good with it so far, but it's like, I need the money to pay for tuition, and then I need the money for moving expenses and I need to get school done," Abele says. "It's more of a matter of perseverance and dedication and tenacity, I guess, for me. That's why I can do it." Low-income students, or ones who are the first in their family to attend college, often face significant challenges in transitioning, McDowell says. Without support from advisors, many students become confused with course requirements or have trouble deciding on their future. "That leaves them with nowhere to turn when they struggle with the transition to college and navigating through the college system," she says. "The beauty of community and technical colleges is that they offer access, flexibility and a wide variety of choices. Yet for some students, that very flexibility leaves them adrift, as they struggle to define goals and figure out which courses to take." New research has revealed how difficult it can be transitioning from a community college to a four-year college — especially in Washington, and especially for low-income students. Only 26 percent of students who start in community college are able to make that switch within six years, which is the sixth-lowest transfer rate in the nation, according to a study released this month by Columbia University's Community College Research Center. Lower-income students, who are more likely to start at a community college, do worse than higher-income students on almost all transfer measurements, the report found. What that means is transfer students from Washington state community colleges are able to earn bachelor's degrees if they make it to a four-year college, but they have a problem getting there. It's a problem, McDowell says, that the state's community colleges have recognized and are trying to fix. Erika Saucedo can't waste any time. The financial aid office at SFCC closes in five minutes, and Saucedo, on a Thursday afternoon, hurries across campus with her 1-year-old son, Isaac, in her arms. She usually can't make these kinds of trips to campus. On top of going to class and taking care of Isaac, she works more than 40 hours a week. But three weeks into the quarter, she hasn't yet received her financial aid, pay she relies upon for her books and other expenses. For Saucedo, planning for the future can be difficult when receiving little help. She wants to transfer to Eastern Washington University when she earns her associate degree, and she says she doesn't get much input into the process from counselors, who are often just as busy as she is. "You don't get the quick response you want. You have to dedicate yourself to do everything outside of school," she says. "I mean, I've got a life. I've got [Isaac.] I work full time. And so it's kind of hard sometimes to be on their schedule." Cynthia Vigil, a counselor at SFCC, says she sees more than 375 students in her busiest months. She is one of nine counselors at the school. In recent years, faculty members have taken on some of the load in advising students. Vigil says it can be a complicated system for students to navigate without the proper help. She says that low-income, first-generation students can be the most driven, but they also often have more going on. If something goes wrong — for example, their car breaks down, or they get sick — it's harder for them to recover academically and financially. "These are real people with real lives," Vigil says. 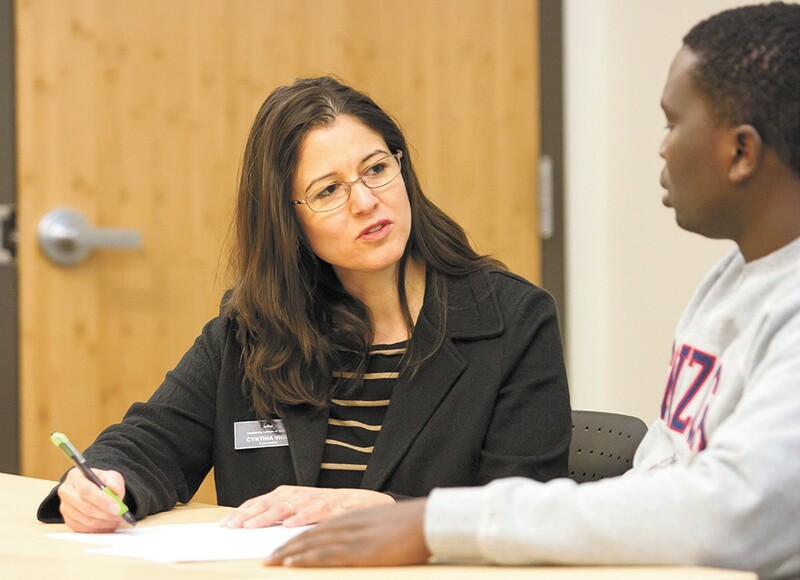 At Spokane Community College, there are 1,400 students for each counselor. In the more than 25 years that SCC transfer director Cathy Shaffer has been there, the number of students has increased, while the number of counselors has decreased. "There's no way, mathematically, we can even see all of the students," Shaffer says. "It seems almost impossible to be able to provide the resources they need." Spokane Falls Community College and others in the state are working to make the path to four-year colleges easier for students. Davis Jenkins visited Washington state last week to meet community and technical college teams and discuss how to improve the system. Jenkins is a senior research associate for the Community College Research Center, the organization that released the report on transfer rates. He notes another factor possibly contributing to Washington's low rate: a limited number of public universities. The two biggest options — the University of Washington and Washington State University — don't focus on community college transfers and are more selective. More university centers closer to college campuses might help, he suggests. He also has helped community colleges make career options easier for students to understand. "People like us try to go on the website and try to figure out the career options, and we can't do it," Jenkins says. "It's too complicated." Community colleges in the state, including SFCC and SCC, have moved to a so-called "guided pathways" approach, similar to the plan Abele has. The idea is to create simple, clear choices for students so they get through college with a degree or certificate. Students may organize courses under a broad interest area, then narrow that down to a credential they want to earn while given advising support throughout. Creating those pathways, however, requires more advisors, Jenkins says. 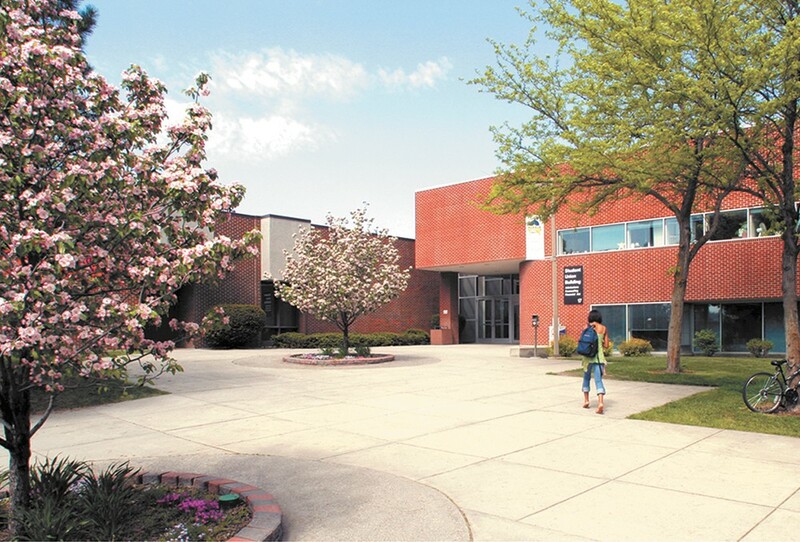 That's why the state's community and technical college system has asked for additional funds for more advising in the state's 2016 supplemental budget. In past years, college courses were better mapped out, he says. But because the goal was to get students in the door, the easiest way to do that was to offer a lot of different courses. Colleges focused on enrollments more than outcomes.